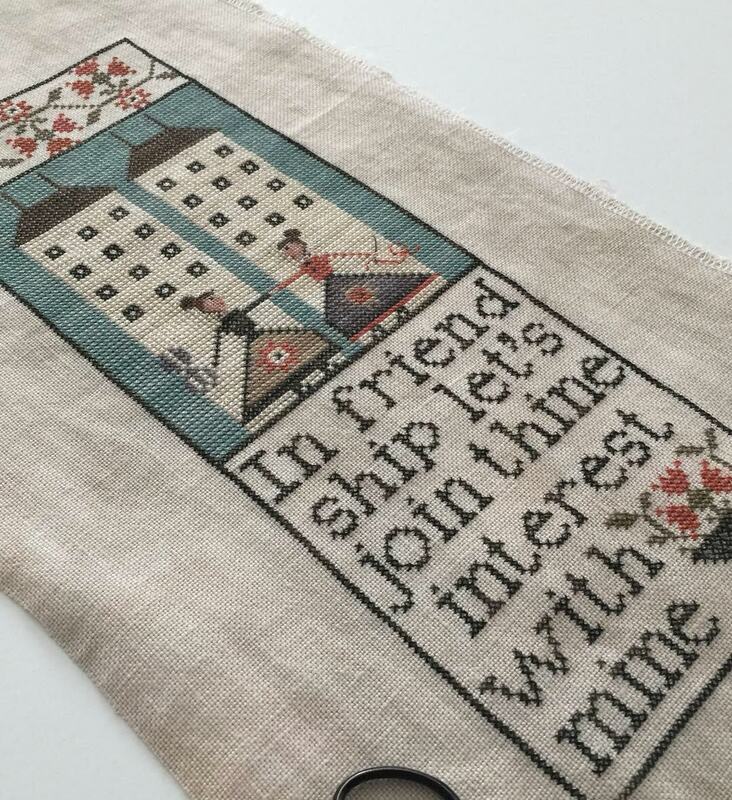 Soul Sisters by Plum Street Samplers - 32 ct. Bramble by Picture this Plus, cotton threads (1 over 2). 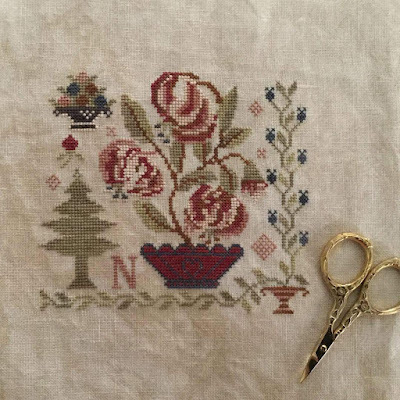 Darling Buds of May by Blackbird Designs - 40 ct. Legacy by Picture this Plus, cotton threads (1 over 2). Sarah Casey Unwin 1848 Sampler by Chessie & Me - 36 ct. Vintage Pearled Barley by Lakeside Linens, cotton threads (1 over 2). Pink House Sampler by Plum Street Samplers - 40 ct. (was Park City Blend by R&R - I washed it and now it's just cream), cotton threads (1 over 2). Spring at Hollyberry Farm by Stacy Nash Primitives - 36 ct. Legacy by Picture this Plus, cotton threads (1 over 2). His Eye is on the Sparrow by Heartstring Samplery - 40 ct. Legacy by Picture this Plus, cotton threads (1 over 2. A Saviour's Praise by Shakepeare's Peddler - 40 ct. Vintage Country Mocha by Zweigart, cotton threads (1 over 2). Mary Gail by The Scarlet Letter - 45 or 46 ct. Vintage Autumn Gold by Lakeside Linens, DMC (1 over 2). Dorothy Walpole by The Scarlet Letter - 40 ct. Vintage Pecan Butter by Lakeside Linens, AVAS Soie d'Alger silk threads (1 over 2). Impressionists Shawl by Helen Stewart - Madelinetosh Twist Light - Leopard, Birch Gray and Yarn Experiments Monkey Sock - Meet me in Charlotte. Toe-up Plain Vanilla Sock - Life in the Long Grass - Garden Party. Size US 1 (2.25 mm) needles (magic loop). A Saviour's Praise by Shakespeare's Peddler PDF Chart from Kitten Stitcher. 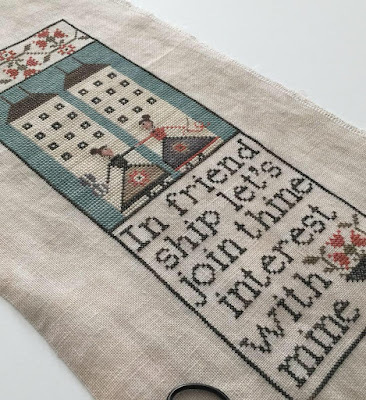 Lucy Snushall by Samplers Remembered from Stitches N Things. Liberty's Welcome and Heritage Sampler by Plum Street Samplers from 123 Stitch. Caroline Broomhead by Plum Street Samplers from eBay. 36 ct. Ligonier Latte by R&R Reproductions from Fire Poppies. I always love your videos and this is no exception. We like a lot of the same patterns, fabrics and threads so it really makes it fun to see what you are working on; everything is beautiful!! Using an iPad sounds interesting too; I may have to look into that. Thank you so much for sharing of your time and talents with all of us; it is so appreciated. Love your cat too! Hugs and happy stitching. Enjoy your company. Have a great time with your relatives!